Prem's: Food Price Inflation - Boon or Bane? For long , we have been considering control over inflation as a indicator of government's performance .Lower the inflation better the government's performance.This article tries to question this basic theory , concentrating on agriculture industry and impact of food price inflation on it. Lets try dig some history to find historical importance of agriculture as income generator.During independence agriculture as a industry accounted for 40-45% of India's GDP.Later due to industrialization of the 1970-1980s and uprising of the service industry in the 1990-2000s , share of agriculture has drastically reduced to 17% of the country's GDP. These are depicted in the following data from world bank. Thanks to service industry revolution , per capital income more than doubled between 2000($450) to 2008($1070), an increase of 137% in 8 years , a factor any country will be jealous with. This is mainly due to explosion of service industry and to be more particular IT and ITES sector. So far so great .. Indian Economy has diversified itself to a range of sectors and made it more resilient one.The above statistics might project as if overall living condition in India has seen a substantial change in the last decade.People employed by agriculture would also drastically reduce over these years and now more labors would work in the industry and service sector than agriculture. But that turns out to be a myth. Basically people depending on agriculture for their living as a percent of total population (22-25%) has remained almost constant over past 50 years[1 page 21]. 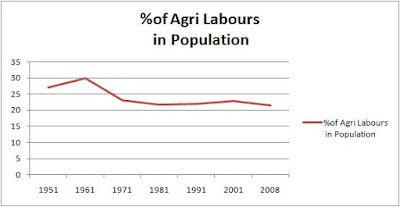 Considering the ratio of agricultural labors to total working population has shown very low decline from 60% of 1950s to 52% currently. So this huge chunk of population gets very small share of Indian development. Sometime statistics hides more truth than reveals.Average Income is perfect example of this. Its as if concluding as if both person in the following picture on average have sufficient food and good health. We are not looking into the standard deviation for the average income [ i couldn't find out the a study (from a reliable source) which projects the deviation in a meaningful way].These facts leads us to conclude that income of farmers has barely increased and so should be their living conditions.Deviation between the Haves and Have-nots is increasing alarmingly.This is also attributed to recent surge in Maoist activities. Subsidized imports to take care of local demand raise. But these are steps to reduce to impact of bad policies on this sector ,than a step to boost up the sector.Do we follow the same rules in any other sectors? We tax import of cars and two wheelers at 100% to support the local car manufacturing industry.Same is the case with alcohol , tyres etc. Even essential services such as health care are not controlled completly. Private hospitals are allowed to demand astronomical fees. But affordable health care is also made available through govt funded public hospitals. Similar policy can be followed in agriculture too. Govt should decontrol the prices ,remove export limitations & add import restrictions (if necessary), so that farmers get right(or more) price for their products.This will make agriculture as a viable business in long term. Sustained higher prices for farm output will definitely percolate within the system and reach cultivators and agricultural labors in due course.For this to become reality, prices raise should be sustained for a longer period. Short term spikes of higher prices tend to in advantage for the middle men, and they never reach the intended recipients.Importantly steps should be taken to reduce the farm prices and retail prices by reducing the vast stretch of middle man acting in this industry. Off course this is not without any short comings.One section of people who will be drastically affected by this move will be the urban poor.They should also be taken care.Govt can strengthen the PDS (Public Distribution System) to provide them with affordable access to food . Comparing India with other far more developed countries will give a picture of what will happen in future in India. Situation is obviously going to get worse from here. Our current GDP of of 8-9% and agriculture growth of 1-2% itself more than foretells the future. Better we take some affirmative steps soon to safeguard this industry and people dependent on it , than indulging in firefighting in a later stage.